(a) The Weighmaster shall weigh and check, according to all requirements of the official Club Capture Certificate, all fish submitted by a member. He or she shall then, if satisfied sign the Capture Certificate. (b) In the event of the Weighmaster being unable to attend, a Committee member shall act in his or her stead. (c) In the event of the Weighmaster or a Committee member being unable to attend, consideration will be given to a capture weighed by an Ordinary Member. (a) The Committee shall have printed and made available to members at reasonable cost, Capture books containing Capture Certificates. 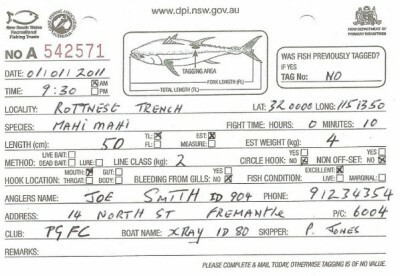 (b) All Capture Certificates after complying with By-Law 2(a) must be lodged with the Weighmaster within 21 days of date of capture of the fish, or before 30th September, whichever is earlier. (c) Any Capture Certificate received by the Weighmaster more than 21 days after the date of capture or after 30th September will be recognised only in extenuating circumstances at the discretion of the Committee. (a) These rules apply to annual trophies and are independent of tournament rules and trophies. (b) All captures must comply with GFAA rules. (c) All captures must be entered on an original numbered PGFC Capture Certificate and submitted to the Weighmaster within twenty-one days of capture or before the 30th September, whichever is earlier. (e) Only Club member’s points will contribute to boat points. (f) Captures in tournaments where anglers or boats represent other clubs in competition against PGFC will not be recognized. (g) Any fish weighed must be in edible condition at the weigh station to be awarded points. All fish must be equal to or greater than the line class being used. Sharks must be equal to or greater than twice the line class being used. Champion Angler. A fish is considered tagged when the tag has been placed and the fish released. All eligible sharks tagged must equal or exceed twice the line class used in the capture. With the exception of billfish, only five of each species willl be accepted tagged orweighed per boat per day. All fish count towards Champion Angler and Champion Boat. Will have single angler points allocated towards club championship scores for all fish. All fully completed Tag Cards and Capture Forms must be returned to the weigh station on the day of capture. (a) In the case of tied scores, the trophy or prize will be awarded on a count back. 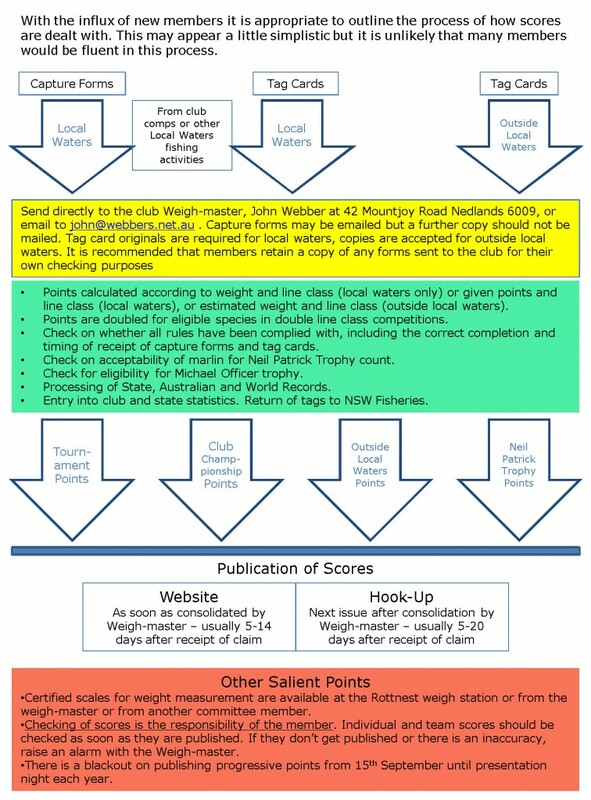 The first capture certificate or tag card to be received by the weighmaster, resulting in the highest point score (or number of fish tagged), will be deemed the winner. (b) The Club year runs from October 1st to September 30th. (c) Fish caught in WAGFA sanctioned competitions other than PGFC events, and other than those disqualified in clause 4(f), will be eligible for club points provided they are submitted on PGFC capture forms. If tagged, a copy of the tag details with tag number, angler name, fish type and line class used must be sent to PGFC Weigh-master within 21 days of date of capture, or by 30th September whichever is earlier. (d) Club Person of the Year is selected by the President and can be any club member except an Honorary Special Member. The recipient may be given the award in more than one (including successive) year. (e) In respect to annual awards, the decision of the Committee is final, and no correspondence shall be entered into.